BioHaven® Floating Treatment Technology is a cost-effective alternative approach for water quality, habitat enhancement, wetland restoration, and more. 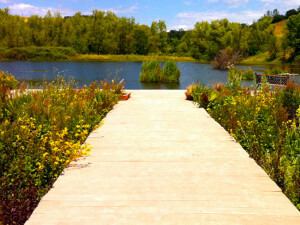 Floating Islands, also called Floating Treatment Wetlands are available in a variety of shapes and sizes. We offer a range of products from mini islands for container gardens or koi ponds, to large floating islands built to suit your need, as well as specialized products to treat wastewater or storm water runoff. Our BioHaven products are made from recycled material and incorporate the elements of biomimicry into every design. BioHaven® can easily be integrated into your LEED projects, resource conservation, as well as most other low impact development & green infrastructure projects. In addition to the myriad of benefits such as carbon sequestration & absorbing greenhouse gases, the BioHaven® floating treatment technology is immune to fluctuating water levels – so they can be applied to most lakes or reservoirs. Are you looking for something larger than a 5 foot x 5 foot island? No size is out of question. The custom floating island is our most popular selling item, this allows more flexibility of shape and design. Want to buy a floating island for a large pond? Maybe you are looking for a 10 x 10 foot island, 15 x 20 foot, or a 20 x 30 foot floating island? We can customize islands to fit your desired application. Tell us what you are using the island for and we can help guide you in the right direction. Consider the shape, size, and weight load that you might be interested in. This depends on a few factors, which we will discuss. 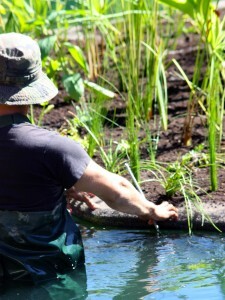 Will you be planting sod on a floating island, will you be using the island for otters, or a possible swan nesting site? If so, these would be important items to share with us prior to manufacturing – as we would need to make some adjustments prior to making the floating island. Custom BioHaven Floating Islands have been used by many respected organizations including Denver Zoo, Montana Zoo, EPCOT Walt Disney, Oregon Gardens, USGS, and many more. You can buy an affordable private island, call today to make it happen. Limited on space, but want to buy an island for the pond or watergarden? A mini floating island may be the perfect product for you. Mini islands, sometimes referred to as Floating Water Gardens, are a scaled down version of the Genuine BioHaven® floating islands. You may have seen the islandscapes pond islands by Freedom Ponds; when they stopped manufacturing, we were asked to fulfill the need and since we already were manufacturing large floating islands, it was a perfect fit. The mini pond islands are easy to order with a variety of standard shapes and models available. Starting at just 5 square feet and up to 25 square feet, these floating water gardens are great for koi ponds, turtle ponds, small water gardens, and even container gardening. For treatment of wastewater and effectively solving nutrient rich water problems. 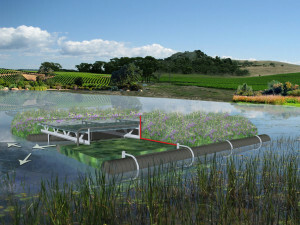 The Leviathan™ is the most powerful type of Biohaven® Floating Treatment Wetland to hit the market. The Leviathan™ integrates high-volume, low-head circulation combined with our BioHaven® island technology for maximum wetland performance. Our efficient air-driven directional diffuser draws in and aerates in excess of 10,000 gallons per minute – pushing it through the BioHaven® matrix and plant roots. The Leviathan™ is a super-charged biofilm reactor and can work hand in hand with your preexisting treatment facility, this customized water treatment solution provides a scalable designed system that is immediately ready to use. Ideal for use in wastewater treatment facilities, as well as stormwater lagoons, dairy and winery effluent ponds. As a reminder, our products have gone through extensive testing and have been used worldwide. BioHaven® Floating Treatment wetlands received national recognition as a top 6 innovative water technology of 2014 by the EPA. Call or email for a quote, please note project details for more accurate pricing. The BioHaven® Living Shoreline & Floating Breakwater products provide a cost effective solution to coastal protection, wave mitigation, soil erosion control, saving real estate, as well as enhanced vegetation and habitat. With high tides pushing further inland, coastal communities are facing challenges that come with rising tides. Many beachfront communities are taking action into their hands and searching for a cost-effective solution to erosion control and shoreline protection…the goal is to save the bay. BioHaven® coastal protection products provide an innovative and proven approach to protect the shoreline, as well as restore disappearing coastlines. BioHaven® Living Shoreline & Floating Breakwater products provide coastal protection, increase biodiversity, improve habitat, and maintain a natural appearance. Our product requires no heavy machinery and is fairly easy to install, using material that most individuals can easily manage. 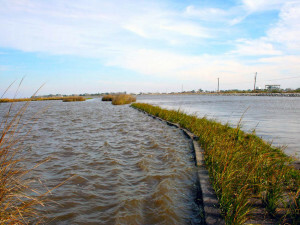 BioHaven® Living Shorelines and Floating Breakwaters have been very successful in Louisiana, as used by the Coastal Conservation Association, as well as Shell Oil. BioHaven® Floating Breakwater was an endorsed innovation by The Water Institute of the Gulf in 2014. Contaminated surface runoff from storm water events is a major potential cause of water pollution in urban, residential and agricultural settings around the world. 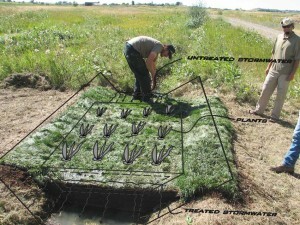 Elevated treatment swales (Elevated BioSwales™ ) containing vegetation are one promising method for treating storm water and agricultural runoff. Bioswales are an alternative and effective method for treating storm water runoff. Over the last few years, Low Impact Development (LID) & Green Infrastructure has been gaining in popularity as people transition toward more sustainable practices. Many communities on the West Coast are looking for green products and fresh ideas to incorporate into their net-zero projects, the BioHaven® bioswale is a perfect fit. The elevated bioswale contains the BioHaven® matrix, which provides about 250 square feet of surface area per cubic foot. Our proprietary matrix is an effective substrate for biofilm development, in combination with circulation, it can be highly effective at transitioning agricultural‐based nutrients and urban contaminants out of water and into local food webs. BioHaven® Elevated Bioswale creates infiltration as well as strong deep roots, both important to effectively treat storm water runoff. Create the ideal bass spawning grounds and develop a highly productive fish habitat with the BioHaven® fish spawning platform. Our BioHaven® fish spawning nursery incorporates platforms suspended from a floating island to support customized spawning beds for different fish species. The very first BioHaven® fish spawning platform was constructed for the BASS ASSOCIATION in conjunction with the New Mexico Bass Federation, this project gained national recognition as it received the Berkeley Conservation Award. Living Walkways are a variation on BioHaven® technology. In addition to the many benefits of a conventional docking system, the BioHaven floating dock construction is aimed at improving water quality, while also providing vegetation and habitat benefits as well. Uses include boat docking, kayak landings, picnic and patio areas, floating gardens and gazebos. Call to speak to a representative about purchasing one of these custom docks. Click here to see a living walkway in action. Swan Nesting Island: Swans are heavy, the island would need to be larger and/or have increased buoyancy. 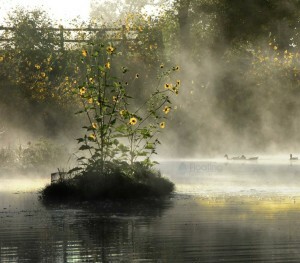 Floating island for a small pond or a tight space. A pretty pond planter – if you are simply looking to decorate your pond with floating planter, try a mini floating island model. BioHaven products are more effective than regular planters, the base of the roots are protected in our matrix & every island works to improve water quality. Eventually roots will make their way into the water – this is a good thing. 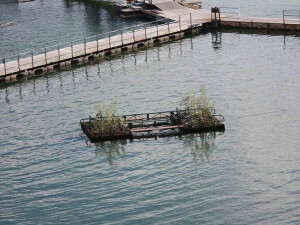 Habitat Enhancement: All floating islands work to improve habitat, small or large islands. Floating Planters, Floating Flower Beds, or Floating Veggie gardens – depending on weight loads, the standard models IPO 400 and up can work…we do not suggest anything under IPO 300 model for growing veggies (due to weight load). Bird Nesting Island: Depending on size of bird, a mini islands (IPO400 & larger) may work.